Notes: Limited edition of the overnight bag, Sexual Liberty - following the Alain Goraguer vinyl release. Drawn and printed on 100% organic cotton. 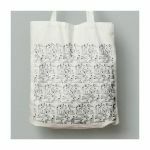 Designed by Erwann Terrier, the beautiful tote showcases the complete drawings of all the explicit exercises of the record booklet. A must-have for this season. You will shove everything you like in this bag with discreet pattern and welcoming hips. 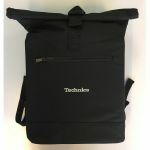 Notes: Stylish multi-functional, roll top backpack from Technics which is both extremely practical & also very cool looking. 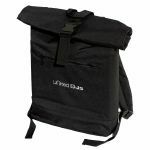 Notes: Stylish, multi-functional, roll top backpack from United DJs which is both extremely practical & also very cool looking.